LAMY’s Al-Star Vibrant Pink Fountain pen and Ink bottle. 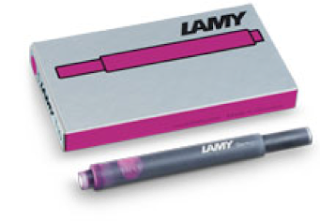 LAMY’s new Special Edition AL-star Fountain Pen, in beautiful “Vibrant Pink,” is a great pen! The color is a deep fuchsia shade, quite the stunner. As are all LAMY special editions, this one has an available matching ink available both in a 50 ml bottle (which you would use with the Lamy converter) or with the disposable ink cartridge, both of which are available through the Pen Boutique store or it’s online web site (www.penboutique.com). If you are unfamiliar with the company LAMY, is German company out of Heidelberg, and has a long history of producing fine writing instruments (https://en.wikipedia.org/wiki/Lamy, or https://www.lamy.com/content/index_eng.html) since their founding back in1930. The pen itself is made of lightweight aluminum, with a stylized oversized, chrome clip and a very comfortable, translucent, ergonomic plastic grip. It has a wonderfully responsive polished steel nib (which can be changed-out to match your writing style from fine to broad including specialized Italic 1.1mm and 1.5mm nibs, as available). 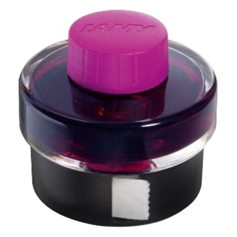 As mentioned, it takes the matching LAMY T10 giant ink cartridges or with the LAMY Z28 converter inserted, can be used straight for the large T52 50 milliliter bottle which also contains a built in ink blotter part of a small roll designed into the bottom of the glass bottle. The LAMY Engineers are world renown for their modern design aesthetic. Click here to learn more. The pen would make a great beginner’s fountain pen, being very easy to hold and use. Even experienced pen aficionados, come over to Lamy because of their innovative style and ease of use. Also, the prices are always very affordable! It is a rugged pen as well, and can handle the daily grind of being carried around and possibly dropped. The “Al-star,” is Lamy’s slightly larger (5 ½ inches or 140mm capped) all aluminum version of Lamy’s Safari pen line-up, which are injection-molded plastic and have a sort of cult following. Final thoughts, for a few bucks, go and get one, try it, I’m sure you will like it, or someone you know will. Happy Spring! !